SPLASH PAD! Free Pool Heat! Free WiFi! Game Room! Castle Bed! 4 miles to Disney! As the owners of this beautiful 7-bedroom, 6-bath villa, we invite you to stay in The Enchanted Retreat! Our spacious (approx. 4,000 sq. ft.) Non-Smoking villa is fully air conditioned with a living room, dining room, seven bedrooms, six bathrooms, and an over-sized 45 ft. pool. NEWLY INSTALLED SPLASH PAD!! In addition, there is a game room with an 8 foot pool table, and an air hockey table. Wireless Internet access as well. No pets allowed. LESS THAN 4 MILES TO DISNEY!!! The main floor of our beautiful home has three king masters, en suite. The fourth bedroom has a castle bunk bed (full on bottom, twin on top), with a bathroom right outside it's door. Upstairs is another king master, en suite. The sixth bedroom has two twin car beds. The seventh has two full beds. These two bedrooms share a bathroom that is situated between them in the hall. Our game room has recently been completed to include air conditioning and heat, with a new flat screen television so you can watch your favorite show while playing pool or air hockey! Very nice! Close to all Disney parks! Large home and well stocked with pretty much everything you need for your stay. Bed and bath linens are a little dated and could be more luxurious but they were adequate. Enjoyed the space with our large family. I am very pleased that you had a nice time and enjoyed our home for your large group! Thank you for your information regarding the linens. We purchase high quality sheets for all of the bedrooms, and replace all towels with new ones on a regular basis. I will see to it that any towels needing updating will be done so immediately. Location was great, kids loved the pool and splash pad. Felt comfortable, just like being at home. We will definitely be back! Your review made my day! So happy it felt "like home"! Looking forward to your return! It was a great vacation home!! We had a blast! Loved the pool and the hot tub. The kids really enjoyed the splash bad too!! House was beautiful!! Our family was celebrating our son's wedding in Disney. The location was perfect, the house was perfect and the wedding was perfect. The kids loved the pool and the game room. Wendy was a pleasure to talk to and made our stay very comfortable. We hope to return some day. Thank you for choosing our home in which to stay during the celebration of your son's wedding! I am so happy to hear that all went well with everything. We would love to have you stay with us again. Thank you!! This large property comfortably housed two families with 5 children. The pool is large and the splash pad great fun with beautiful lights at night. The bedrooms were spacious and comfortable with clean linen and plentiful towels. There was lots of space to sit and lounge or eat around the pool as well as in the house. The kitchen was well equipped and laundry facilities excellent. The booking process and communication with the owner was superb, instilling confidence. The house is located literally minutes from shops, restaurants and of course Disney world. It is on a well cared for gated community. I would highly recommend this property. So happy to hear that you enjoyed our home! Please come back and stay with us again - we would love to have you!! So happy to hear you had an enjoyable time! Our pool is professionally cleaned on a regular basis. The pool tiles do get affected by the use of sunscreen by guests. Our property manager lives in Formosa Gardens and would have gladly been there promptly to address this concern had she been contacted. She prides herself on a clean, well-maintained home, and we are very fortunate to have her. We look forward to your return to The Enchanted Retreat!! 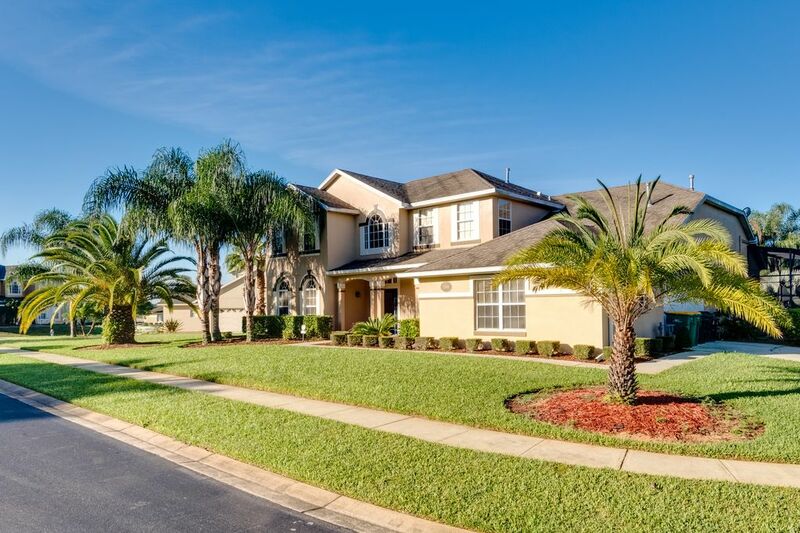 Located in the beautiful gated community of Formosa Gardens Estates, you will enjoy a large lot in a private and tranquil setting, yet you are less than three miles to Disney World!!! Formosa Gardens is a one minute drive to a grocery store, pharmacy, walk-in clinic, and many restaurants. A 24-hour Target Super Store is less than a mile away, in addition to a Premium Outlet Mall. Saturday to Saturday rentals preferred during Summer Season, March, and holidays. Must be at least 28 years of age and present during the rental period to book. ALL RESERVATIONS WILL REQUIRE A SIGNED RENTAL AGREEMENT PROVIDED BY THE OWNER IN ADDITION TO THE AGREEMENT POSTED ON THIS SITE. There is a cancellation policy other than stated here by HomeAway/VRBO. Please contact the owner (Wendy) for details.